One of the most incisive arguments I’ve ever heard about climate change came from Elon Musk, the guy who founded Tesla Motors. He started out with a simple inescapable fact: the supply of fossil fuels is very limited and sooner or later we will need to find another source of energy, because at the rate we’re using it we’re going to run out. If we know we have to get off oil no matter what, we know that is an inescapable outcome, why run this crazy experiment of changing the chemical composition of the atmosphere and oceans by adding enormous amounts of CO2 that have been buried since the Precambrian Era? That’s crazy. That’s the dumbest experiment in history by far. I like this because the simple elegant logic of his argument cuts right through the insanity of Washington’s current climate change “debate”. 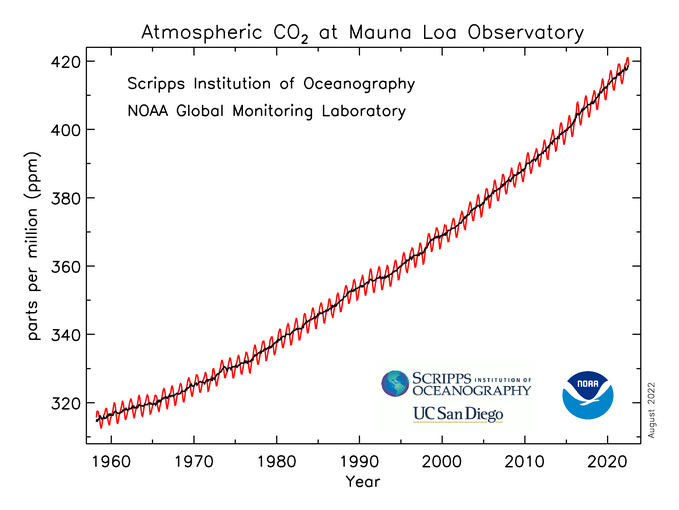 It’s easy to measure CO2 concentrations; there is no doubt they’re rising for years and that human activity is involved in this. The data below is from NOAA; notice how CO2 concentations vary slightly over the course of the year (red line) but over the course of 30-40 years the trend (black line) is extremely clear. Earth’s atmosphere (as illustrated) is transparent to much of the incoming solar radiation, but certain so-called greenhouse gases in Earth’s atmosphere, especially water vapor and carbon dioxide, absorb very strongly in the regions of the IR spectrum where Earth’s ~288 K surface emits the most radiation. When radiation is absorbed, it’s converted to heat* or random motion of molecules. As these gases warm up, they will eventually re-emit the energy they absorbed in the form of infrared radiation; but by absorbing then re-emitting, they slow down the loss of heat from Earth’s surface, and that causes Earth to remain warmer than it would be otherwise, in the same way a blanket keeps you warmer by slowing the rate of heat loss from your surface. What we see matches what we predict we would see based on the observed increase in CO2 concentrations — a corresponding slight increase in average temperatures. I’m deliberately keeping things simple here and avoiding some more complicated discussions we could get mired in, but those are the fundamentals. We could of course spend plenty of time arguing about how much the climate will change as a result of all this, exactly how far temperatures will rise in the years ahead or how significant that change will be. This is to my way of thinking a fruitless argument, because — as Musk pointed out — we are in effect right now running an experiment to see how much we can change the climate. We may not know for certain how this experiment will turn out, but quite frankly we probably don’t want to find out. This experiment is dangerous and also pointless, because eventually we’re going to run low on oil anyway. We have to switch, so why not do it sooner rather than trying to see how much we can change the climate in the meantime? We don’t of course want to solve this problem by damaging or destroying the economy. Nobody wants to be unemployed. I get a little nervous when people start talking about taxing carbon, for example; I could be wrong, but I feel like implementing a carbon tax is a great way to make manufacturers move their operations to other countries that don’t have carbon taxes. So I think this boils down to two questions. What alternative energy sources are most viable right now (or could become viable with a little more research)? And how could we promote their adoption without damaging the economy? This is the climate change debate we should really be having and aren’t. So here’s where I want to editorialize a bit. The single largest use of fossil fuel at the moment is for transportation, followed by electric power. To replace fossil fuels for transportation, we have basically two main options. Generate biofuel from algae and cellulose. These technologies cannot yet generate the volume of fuel we’d need at prices that can compete with fossil fuels, but with additional research they might become competitive. The first alternative might seem controversial because the Fukushima disaster has made nuclear power plants extremely unpopular. But the simple fact, I think, is that if you’re talking about switching over to electric cars, you’re going to need a huge amount of additional generating capacity, and with existing technology the only non-fossil way to supply that is nuclear. Solar and wind are only viable alternatives in certain regions of the country. Definitely they should be fully exploited in those regions. But the simple fact is that with existing technology you can’t power Seattle with solar panels; they don’t get enough sun most of the year. So if you’re talking about switching to trains and electric cars (Musk’s preferred solution), ultimately I think over much of America you’re talking about switching to nuclear power. Should we learn to like nuclear power? This is a debate we need to have, I think, although right now politicians won’t touch it with a ten-foot pole. Nuclear is definitely an abundant source of energy that doesn’t generate greenhouse gas during operation. The main problems are how to store the waste — reprocessing it would significantly reduce its volume but is expensive, and of course you’re still left with some waste that has to be buried. There’s no state that wants a long-term waste repository anywhere within its boundaries, not even Nevada. Moreover, if there’s one lesson we learned from Fukushima, it’s that nuclear power stations don’t mix well with tsunamis and major earthquakes, and locations for nuclear power plants would have to be carefully chosen with that in mind. The Pacific Northwest, for example, is apparently due for a massive 8.0 – 9.0 earthquake/tsunami at some point in the next century, and locations for any nuclear power plants built in that region should be chosen and designed with that in mind. If you find nuclear unpalatable you may prefer biofuel, although you have to be careful to specify what kind kind of biofuel you’re talking about. There’s no way you could power America on corn starch ethanol, for example; you can’t grow enough corn to do it. Ethanol from cellulose, however, or fuel from algae are options that could work, although neither is yet practical on the scale you’d need to generate such large quantities of fuel. It’s going to take more research and more work to make them commercially viable. Algae biofuel, for example, faces some interesting technical challenges. If you want to grow algae in open ponds, for example, your algae becomes vulnerable to competition from other unwanted strains and from bacteria, competition that could quickly kill off your chosen high-oil-yield strain and take over the pond. To make matters worse, harvesting/extracting the oils you actually want from the algae in your pondwater is expensive. If you grow algae in glass or plastic tubes, aka “photobioreactors”, by contrast, production becomes still more expensive and now you suffer from space constraints. There may be ways to overcome these challenges, but it’s going to take more work to do it. Cellulosic ethanol likewise faces some technical hurdles. Cellulose is also called “dietary fiber”; it’s the stuff plant cell walls are made of, and as such it’s one of the most abundant polymers on Earth. Like starch, it’s a polymer made of glucose sugar molecules. The difference lies in the way the sugar molecules are linked, which makes it more difficult to break down than starch. We definitely can break it down, either with enzymes we’ve borrowed from various bacteria or with a chemical process, and you can feed the resulting glucose sugars to yeast to make ethanol just like you would if you were going to make liquor. The problem however is efficiency, scale and cost. There’s a huge difference between turning out a million barrels a day and — oh, look, we made a gallon of this in my lab! That’s the gap which both algae biofuels and cellulosic ethanol are still crossing. To my mind this is the climate change debate we should be having. Do we want to embrace the train and the electric car (short-range as it is) and start building more nuclear power plants? Do we want to invest in biofuels research and scale-up? This is a tricky and interesting challenge and it’s one we need to figure out. And if we can pick a good solution, we can do so in a way that rather than damaging our economy will spur economic growth. Building power plants or biofuel production facilities is creating jobs, after all. Instead, of course, our politicians are wasting time bickering about whether there’s even a problem. *I’m using the everyday definition of heat as “hotness” or increased temperature here, not the more specific thermodynamic definition. Another source of energy is geothermy, its exploitation is easier in zones of geological fracture. -in the longer term a susbtantial decrease in absolute energy consumption in transportation instead of a simple switch from one fuel to another (eg. through massification of the transport system) given the alternative sources of fuel are inherently less energy-dense (except nuclear power) than fossil fuels and may not support the current (let alone a growing) transportation infrastructure. Both being unfortunatelty unpalatable to politicians given the sums required and societal choices involved in solutions for either timeframes. Wouldn’t combustion of biofuels still produce CO2? Is there something I’m missing about the relevant chemistry that explains how substituting them for fossil fuels improves climate change? The difference is that the plants get their carbon by taking it out of the atmosphere. Then, when they burn or decompose, the carbon goes back into the atmosphere, Therefore biofuel is carbon neutral, assuming no fossil fuels are used to produce it (e.g., operating farm equipment, producing fertilizer, fermenting, refining and transporting the biofuel). Yikes – I’m dismayed I completely blanked on that point. We’d go a long way toward mitigating climate change if we just got over our irrational fear of nuclear power. Sidebar: Elon Musk is not the founder of Tesla Motors. Martin Eberhard and Marc Tarpenning founded the company in 2003, Musk came on board in 2004. As always, thank you for the thoughtful post, Mr. Mutant. I loved your vaccine post and have bookmarked it. Regarding alternative fuels I wanted to add to your discussion that the fuel source, as you say, really has to be appropriate to the area. Where we live, we are surrounded by miles of national and state forest that is completely overgrown and puts us at risk for fire, not to mention the risk of releasing all that carbon into the atmosphere through wildfire. Biomass isn’t just plants that you grow to produce energy. In the west, we have loads of mismanaged forests combined with drought. We have enough biomass from these forests to provide a never-ending, sustainable flow of energy to the grid. New technology biomass gasification plants are becoming more and more viable — even GE gas has started producing them. These plants pollute almost nothing and they produce energy, heat (that can be used for heating nearby buildings) and biochar. Biochar is basically charcoal that is used as a powerful soil amendment to replenish microbial health to soil, and it also increases the soil’s ability to hold water. California Central Valley farmers are using biochar to great benefit. They also provide a revenue source to help thin forests which takes a lot of manpower. Another thing I think is not discussed nearly enough is simple conservation. In the ole’ days, conservation was not just a liberal idea – it was a CONSERVative idea. There is so much more we can do to use less energy, basic things like installing double-paned windows, sealing doorways, biking or walking, but also developing better technologies. 3) human greed. This is the case with the recent shutdown of the So Cal Edison San Onofre Generating station. SCE is a privately owned company and so rather than making its customers its main priority, it concentrates on making money for its shareholders. You can look up the horrifying details – about how SCE swapped an old generator for a new, untested, significantly different generator which started leaking radioactive steam after less than 2 years (the generator was supposed to last 40 years). SCE was allowed to install the new generator with minimal fanfare simply because it promised the NRC that the new generator was simply a “like for like” replacement. In a subsequent investigation it was found that SCE wrote to Mitsubishi Heavy Industries requesting that they not mention that the replacement generator was significantly different from the previous one otherwise the project would be stalled. http://articles.latimes.com/2013/may/28/local/la-me-0529-san-onofre-20130529 SCE wanted to keep the generator operational even after the malfunction, just operating at a lower output. Had that generator melted down, about 12 million people within a 50 mile radius would have had to leave immediately. The human and economic costs would have been enormous. That plant was also on an earthquake fault and in a tsunami zone. So from an economic point of view, when considering all real costs (and I have only gone through a fraction of those), nuclear energy does not make sense. From a safety point of view, nuclear energy is ta true risk, especially in light of extreme weather from climate change, earthquakes (naturally occurring or caused by fracking), and terrorism. What do you think about Nuclear Fusion? Steady progress is made in this field and if this technology will become open to the public we would neither need Nuclear fission power plants nor any kind of biofuel in order to compensate our need for electric energy. Fusion is interesting, maybe even promising, but it’s not perfect. It’s a small exaggeration to say it is clean. Yes, it is cleaner than fission, but it still produces some radioactive waste. That’s because the deuterium-tritium (D-T) reaction produces neutrons, which are absorbed by stable nuclei in the reactor vessel and/or coolant, thereby making some of them radioactive. There are fusion reactions which produces no neutrons, but they would require much higher temperature and pressure. Someday such reactions may provide truly clean fusion power, but we had to start with D-T because it is by far the easiest, most accessible fusion reaction. Right now, electric cars are a start, and it will take time to see a massive conversion from conventional cars. In that time, power plants are necessary for determined/estimated growth. Power plants are not a final solution, but they are the only current viable option, still better than no solution or a poor solution (look at Germany). Research for renewable energy is super important and shouldn’t ever be in question, but funding needs crowd sourcing like most things it functions like a business.